Q. Coach, first of all, congratulations on a great season. Your assessment of the game, and what did you tell your players after the game? COACH MICHEL THERRIEN: I'm almost speechless. It's tough. We were that close. It is really tough, because this is a group that gave what they got. They deserve a lot of respect. We got beat by a quality team. They showed it all through the regular season and through the playoffs. They played really well. They were tough to play against, and the hockey god was not on our side tonight. But they deserved to win the Stanley Cup. Q. What did you say, if anything, to them when the game was over? COACH MICHEL THERRIEN: There's not much to say after a game, you know? It hurts. So you could feel the pain from everyone. We're going to take the time to sit down with each player this week. I'm very proud about that group. I'm really proud about that group, what they accomplished this year. So they grew up really quickly in the last two years. Q. Two years ago, this was the 29th ranked team among 30, and you just played a terrific Stanley Cup. Can you reflect a little bit on the progress the organization has made in just two years? COACH MICHEL THERRIEN: We made big strides, there's no doubt about that, over the last two years. We're going in the right direction with those young kids. They were surrounded by good veterans. And the future is bright with those young kids. And definitely this is a team that it's really fun to coach, because they have a lot of passion. They want to learn. And they paid the price to try to get better. So I'm really proud of my players. Q. Can you talk about the Conn Smythe winner, [Red Wings forward Henrik] Zetterberg, his two way play? How rare is it to have a guy excel at both ends like that? 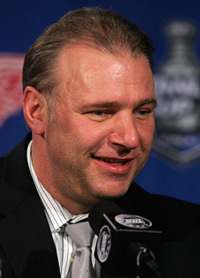 COACH MICHEL THERRIEN: He's there in his career. He's right there. He certainly deserves it. He's got experience, and there's no doubt he was an important player for that group. Q. After the first two games, the series was extremely close. Could you point a finger at what you thought the difference between the two teams was? COACH MICHEL THERRIEN: Obviously, we were really nervous in our first game. And they were uncomfortable. And with good reason; it's a lot to demand to those young kids to play in a Stanley Cup Final. And I thought we learned quick, because after Game 3 we started to play our game. They were tight games, could go both ways. Tonight, this game could have gone both ways as well. You learn a lot in those situations. And that's going to make us stronger in the future.